Hooray! It looks like Santa will be delivering all Formula 1 fans the 2013 Formula One season review this year. The DVD/Blu-Ray will be released on December 16th, 2013, according to Amazon.co.uk. The official Duke Video website has a release date of December 18th for the DVD and December 20th for the Blu-Ray, but either way it is before Christmas. 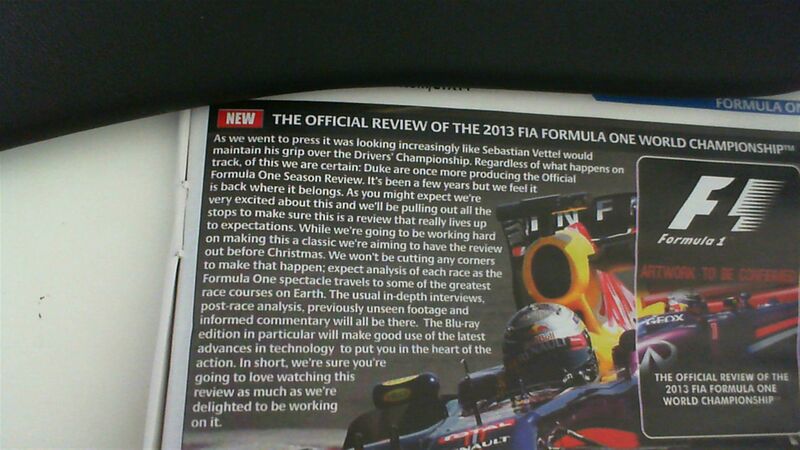 Last year, the 2012 season review was released after Christmas. I commented at the time that sales were probably down compared to previous years as a result, so I am happy to see that this year reverts back to tradition. Amazon currently have the length as 300 minutes, but I imagine that may change slightly. I don’t know who is voicing the review, as of writing, I have not seen any tweets from Will Buxton or Ben Edwards this year saying that they have voiced any of the DVD. I will update the post nearer to Christmas to confirm details on any extras that may be included and any Blu-Ray exclusives. Update on December 6th – Amazon has pushed the DVD release back to December 23rd, whilst worryingly the Blu-Ray has been pushed to January 6th, 2014. I’ve asked Duke Video on Twitter if these dates are indeed correct. Update on January 13th, 2014 – Well we’re now a week after the original Blu-Ray release date, except the Blu-Ray is not out. So, where is it? Bumped to February 10th, according to Duke. Great. Really long review, and the release dates give them plenty of time to rush things! I’ve been buying reviews since 2003, and have a few old ones on VHS. There’s no doubt that some of the reviews are just terrible, some are really great, but the best reviews are the ones which tell the story of the season. Each race needs a short introduction to give it some context, say what has happened since the last race, and guide the viewer through the key aspects of the race. In 1999 the review told the story of the 16 race championship in sufficient detail, and in just over 2 hours. I’m sure that Duke would be able to go through 19 races in 2.5 hours if they actually made some difficult decisions about which material is important to include, rather than the easy 5 hour route of overloading the review with content, albeit producing a unsatisfactory snoozer of a review. The amusing thing is that last year’s review was 5 hours and yet still managed to miss things out, I think each race did not have a build-up section if I remember correctly (or completely missed out Qualifying). Something silly, it was. You’re partly right on that point. In order to fit the extra features on the 2012 DVD, they cut out all the buildup, practice & quali portions (basically the Buxton stuff). For the Blu-ray edition however, they sort of lumped those cut bits together, and stuck them as a 2hr feature in their own right (Narrated by Buxton) on Disc 2 of the Blu Ray. I must admit it was very confusing (The 2011 DVD had the whole review, but didn’t contain any extra features, which were all blu-ray exclusive for that year). There is no doubt that we currently have more access to F1 material than ever before on a race by race basis (even with highlights for 50% of the races) with better camera angles, more interviews and greater insight than in the past. As a result I feel increasingly less reliant upon the end of year DVD, because there does not seem to be as much fresh material. Compared with 1988 (yes I’m a bit old school !) where a season dominated by 1 team (and with a fraction of the race by race coverage we get now) was followed by an awesome “Honda – all fired up” end of year review of approx. 2.5 / 3 hours… using angles and interviews not seen on TV. I agree with George’s point above – go back even further to the irreverently narrated Clive James reviews of ’82 / ’84 and 86 where a cleverly woven story of these years was mixed with his laconic humour and accompanied by the major action in videos ranging between 90 mins and 2 hours……. sometimes less can be more !! Having said that will I be disappointed if Santa does not come up with this on Christmas Day for me – Of course ! That’s very interesting news, although it depends what they mean by ‘produced’ – as in physically assembling and editing the footage etc. or just responsible for mastering the images onto a blu-ray disc and packaging and shipping – AKA Distributing. I was under the impression (from speaking to FOM employees) that FOM themselves produce and edit and assemble all the content including graphics & presentation etc. then send it off to the distributors (Universal in 2011 and Metrodome in 2012) about a fortnight after the season is finished, and the distributors are responsible for burning the discs and shipping them on time. After all, the content in terms of graphics and presentation was identical from 2011 to 2012, despite the change in distributor. However, Duke say that they are “producing” the review, rather than just distributing it. Now, maybe technically Universal, Metrodome, Duke etc. do produce the review in-house, yet FOM send some guys over to ensure the quality is consistent between years (in terms of presentation, menus, graphics etc.) Anyway, i’m at a bit of a loss as to what duke’s role is in all this, whether they’re actually responsible for the production of the blu ray, or just the distribution. The impression I got is that FOM weren’t happy with Metrodome delaying the release in 2012, so maybe they’re switched back to Duke as a fail-safe, as they are more reliable and experienced with these sorts of productions. Anyway, just thought you’d like to know. I’ll email duke and see if they can clarify their role in the blu-ray production a bit more clearly. Makes much more sense now.